You either love or have the new Sega Forever game service that serves up old games to iOS and Android. There’s word on a new upcoming game for the service. So far we’ve gotten Sonic the Hedgehog, Altered Beast, Kid Chameleon, Comix Zone and Phantasy Star II. Now, EUROGAMER.net is reporting that Girl’s Garden is set to be released on the service. The game was only released in Japan. The 1984 game’s premise is that your character has to keep her boyfriend straying. So, she’s gotta collect ten different flowers and return them to her boyfriend's house. I’d really love to play this game. Especially since that’s how my wife kept me from straying when we were dating. I tried to play a couple of these games, but I can’t deal with controlling an old school game on a phone. Luckily, if you’re into this type of thing, you can Bluetooth it. The Star Online has instructions on how you can use Nintendo Switch joy-cons with Sega Forever. 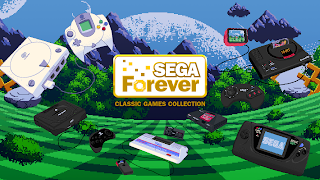 Just google “How to play Sega Forever games with Switch Joy-Con controllers” and the world will be your oyster. Or at least some type of seafood. For the record. It’s been a long time since I held and played with an actual 2600 controller. I mean, playing Yar’s Revenge, I was trying to figure out whether to hold it from the top or the side. I think gripping it with my fist was easier when my hands were smaller. Small hands I know you’re the one. Love this type of stuff? Subscribe to the Instantly Dated YouTube channel. You can get notified of new posts by entering you email address in the "follow by email" box on the right. car games unblocked so its motivation post and blog i love this really how to do this. If you love B-movies, retro sci-fi movies, geek YouTube channels, old school sci-fi TV, nerd podcasts, retro toys, low-budget, cult and schlock TV and film, then Instantly Dated is for you! Contact me, Chris McHugh, at InstantlyDated (at) gmail.com. Copyright 2017 Christopher Michael McHugh. Simple theme. Theme images by Jason Morrow. Powered by Blogger.